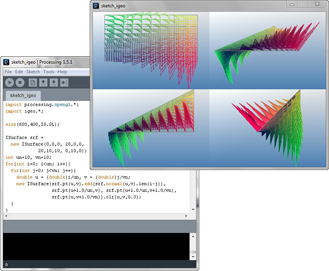 piGeon is an interface for Processing (http://processing.org/) to iGeo library. This interface makes the 3D modeling process in computational design simple and easy yet powerful and flexible with Processing's compact and extensible coding environment and other libraries in Processing to work with various media like sound, video, network and hardware. All site design and contents are copyrighted by Satoru Sugihara, all rights reserved unless otherwise noted.